Lost Addicts Blog: LOST Addicts Blog is Published in New LOST Compilation! The Take2 Guide to Lost … everything that was Lost and now found. Announcing the release of the Take 2 Guide to Lost. Over 50 contributors, comprising of established reviewers and academics, award-winning sci-fi authors and lay writers, ask and answer all your questions in this ultimate eBook compendium to one of the most successful TV shows ever. New York, NY August 12, 2015 - Introducing the Take2 Guide to Lost … a definitive resource of over 400 articles from an incredible community of like Lost-lovers. Due to its masterful storytelling, suspenseful execution and Rorschachial intonation, Lost generated a tidal wave of online comment never before seen for a television series. We’ve combed through the nooks and crannies of cyberspace and fashioned some of the best and brightest posts and pieces into this treasure trove of deliberation. We have gathered and sorted these online articles into a variety of chapters: 'Overture,' with a sampling of posts about the series from various vantage points; 'Cast and Characters,' with entries on all the major characters and some fun bits about the past and future roles of the major actors; 'Mythology,' which includes posts on the Smoke Monster, DHARMA, the Frozen Donkey Wheel, and how religion was reflected on the series; 'Philosophy,' ranging from scholarly but accessible posts on the philosophy and philosophers referenced in the show, to a post on how the series affected one writer's personal philosophy; 'Structure,' including discussions on the flashback/forward/sideways, the DHARMA stations, and a physicist's explanation of the science of time travel; 'Interviews' of the showrunners and writers; and 'Ending,' a largish chapter on the breadth of views about the brilliant and controversial series finale. 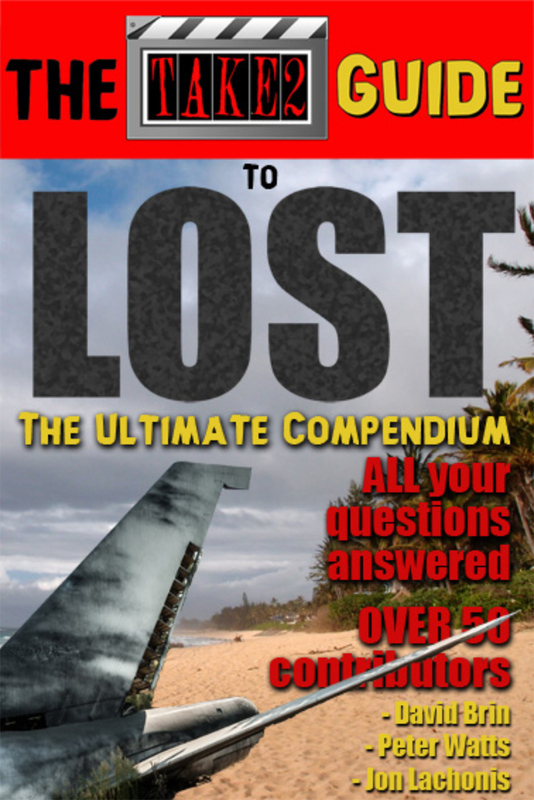 The Take 2 Guide to Lost - The Ultimate Compendium - goes on sale on September 18, 2015. It will be on-sale at Amazon, iBookstore, Google Books, Kobo, Nook and at our own dedicated book store. There is a sample download of over 400 pages now available. It contains the full first Chapter, a sample of the Cast and Character Guide, the Introduction and the Index for all the other Chapters … and the complete Season 1 of the Episode Guide. I'll have to check it out. I hope it has the rant between myself and Addict in the comments from the Meet Kevin Johnson episode! !